Paris. 23 October, 2018 . Airbus will be showcasing a myriad of smart solutions for safer oceans at this year’s Euronaval in Paris from October 23 to 26. 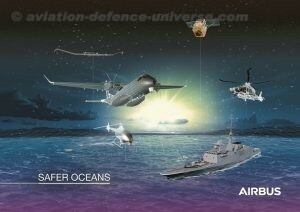 The portfolio presented will range from maritime awareness centres, secure seamless communications services, through satellites and related services, to Unmanned Aircraft Systems, aircraft and helicopters. Airbus’ uniquely broad maritime portfolio enables customers to make the right decision and act at the right time, capitalizing on 50 years of experience in the maritime domain. Additional intelligence can be provided by drones such as the Aliaca UAV (Unmanned Aerial Vehicle). With 3 hours flight endurance, the electric powered Aliaca provides a 360° panoramic coverage with its new generation gyro-stabilized vertical turret over a range of between 10 and 50 km. Ideally adapted for maritime missions, it is catapult launched and uses a dedicated net landing solution to perform intelligence missions ahead of the ship. Another offered solution is the High Altitude Pseudo-Satellites (HAPS) Zephyr platform. Running exclusively on solar power and flying above the weather and above conventional air traffic, this system is complementary to satellites, UAVs and manned aircraft. Ideally suited for “local permanent persistence” (ISR/Intelligence, Surveillance & Reconnaissance), the Zephyr has the ability to stay focused on a specific area of interest, which can be hundreds of miles wide, while providing it with satellite-like communications and Earth observation services over several months without interruption. Scale models of both drones will be visible at the Airbus stand.